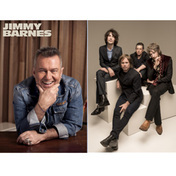 Jimmy Barnes and You Am I will be performing on the Race and Rock stage at Hidden Valley on Saturday 20th June 2015. Jimmy Barnes is a powerhouse performer and has the highest number of hit albums of any Australian artist. We have seen Jimmy ignite the Hidden Valley stage previously and that is something we are sure everyone will look forward to seeing again in 2015. Performing before Jimmy will be You Am I, who are one of Australia’s most successful and internationally admired bands of all time. You Am I have a string of credits including being the first Australian band to have released three successive albums that have debuted in the #1 position on the ARIA charts. The band is centred around the prolific song writing skills of singer/guitarist Tim Rogers and have 10 ARIA awards on their mantelpiece. Kram, Mark, Phil, Darren and Davey from Spiderbait, Jet, Grinspoon, Powderfinger and You Am I, are the Antipodean Rock Collective. A.R.C. will bring an unforgettable party to Darwin featuring some of Aussie rocks most iconic players on Sunday 21st June 2015 for Hidden Valley’s RACE AND ROCK. The Antipodean Rock Collective are a distillation of Australian rock and roll, with unswerving fervour and a history that remains peerless. Comprising members from 5 of Australia’s biggest rock bands A.R.C. come together to form a spectacular Australian contemporary rock group! A.R.C. will be supported by the mysterious, intense, crazy and captivating alternative Rock and Blues singer DEAN RAY and his band. Dean has enjoyed immediate recording and touring success since being runner up of X-Factor Australia 2014, including a gold status album.